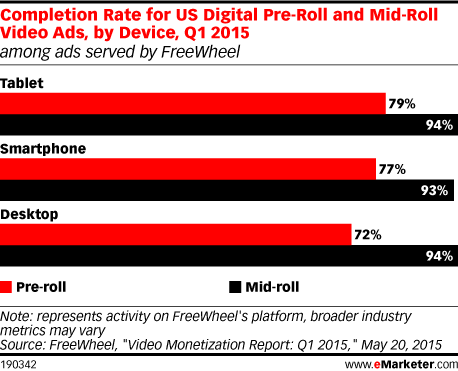 Data is from the May 2015 FreeWheel "Video Monetization Report: Q1 2015." FreeWheel served 125+ billion video ad views in 2014. The data represents only professional, rights-managed video content from FreeWheel's customers. FreeWheel works with Linear TV publishers with digital video content (e.g., broadcasters, cable networks and cable and satellite operators) as well as digital pure-play publishers (e.g., Hulu, Netflix, YouTube).